Take a boating safety course. 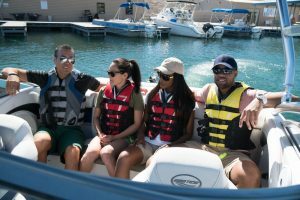 Gain valuable knowledge and on-water experience in a boating safety course with many options for novice to experienced boaters. Check equipment. Schedule a free vessel safety check with local U.S. Coast Guard Auxiliary or U.S. Power Squadrons to make sure all essential equipment is present, working and in good condition. Make a float plan. Always let someone on shore know the trip itinerary, including operator and passenger information, boat type and registration, and communication equipment on board. Wear a life jacket. Make sure everyone is wearing a properly fitting U.S. Coast Guard-approved life jacket. Watch the weather. Always check the forecast before departing on the water and frequently during the excursion. Know what’s going on around you at all times. Nearly a quarter of all reported boating accidents in 2017 were caused by operator inattention or improper lookout. Know where you’re going and travel at safe speeds. Be familiar with the area, local boating speed zones and always travel at a safe speed. Never boat under the influence. A BUI is involved in one-third of all recreational boating fatalities. Always designate a sober skipper. The Safe Boating Campaign is produced under a grant from the Sports Fish Restoration and Boating Trust Fund and administered by the U.S. Coast Guard. Statistics are from the Coast Guard. More boating safety tips at www.safeboatingcampaign.com/resources.